China strikes again! Another massive modern skyscraper went under construction in Chinese Wuhan, designed by worldwide famous architects from Adrian Smith + Gordon Gill Architecture. 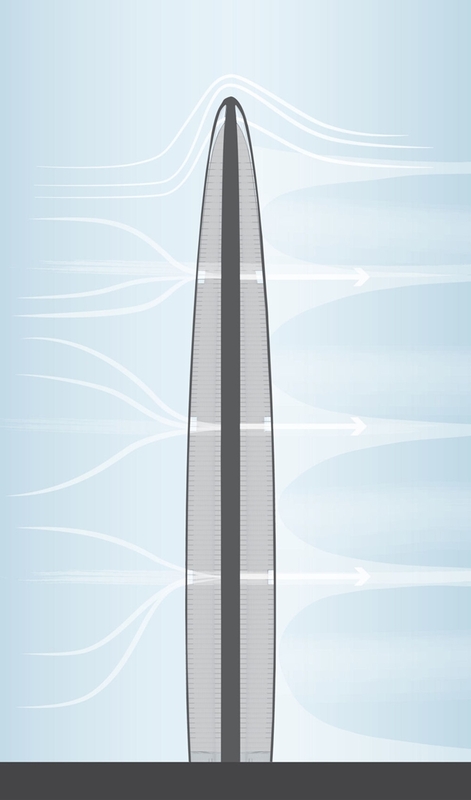 Greenland Center will join the club of Chinese skyscrapers taller than 600m (1,968ft) along with the Shanghai Tower and Ping An Finance Center. 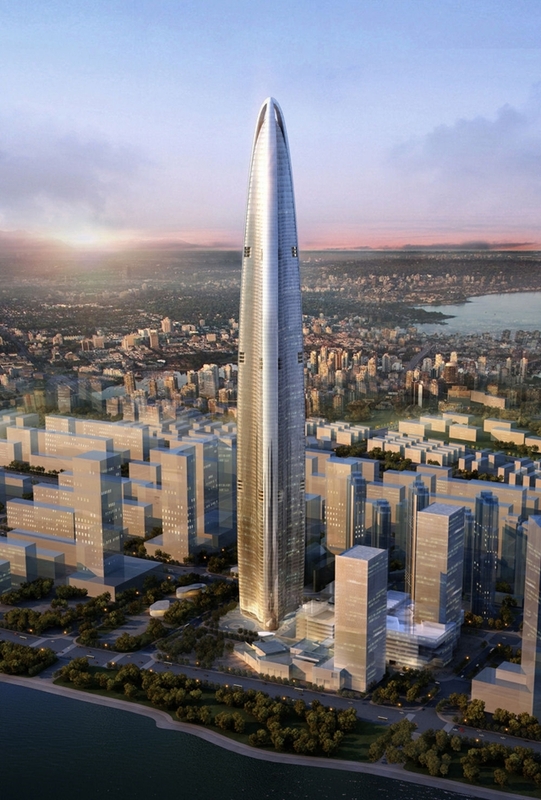 Greenland Center will grow to the 636m (2,086ft) and 118 floors. 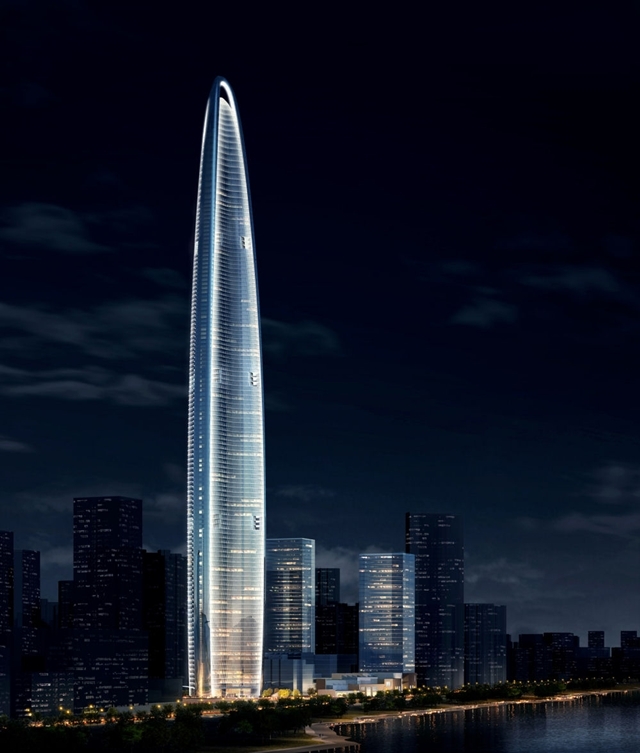 It will put 632m (2073ft) tall Shanghai Tower down on third place while Ping An Finance Center will keep its place as #1 with 660m (2,165ft). 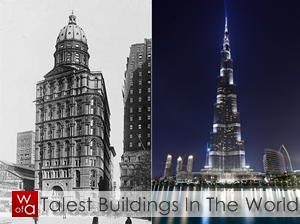 All three skyscrapers will be in top 5 tallest buildings in the world when finished. 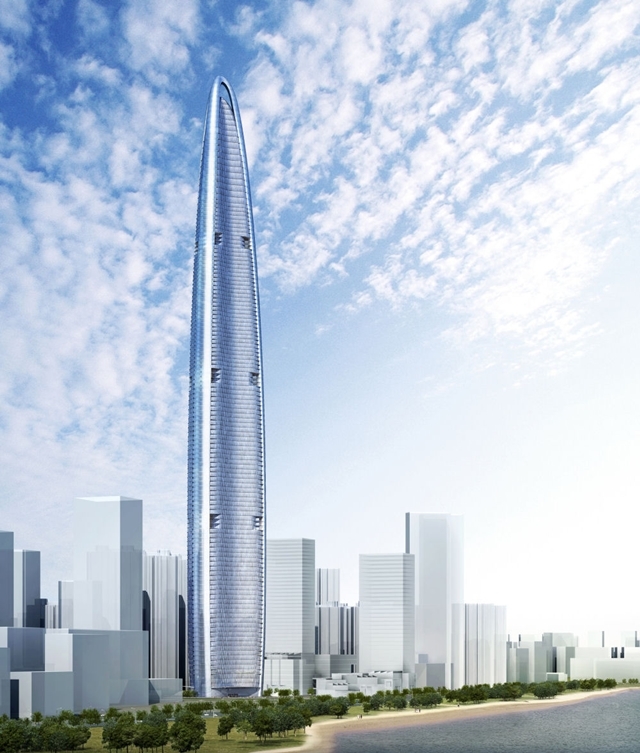 "The 118-level tower in Wuhan, China will be comprised of about 300,000 square meters of floor area, including about 200,000 sm of offices, 50,000 sm of luxury apartments and condominiums, a 45,000 sm five-star hotel, and a 5,000 sm, 27-meter-tall private club with spectacular views at the tower’s penthouse level. 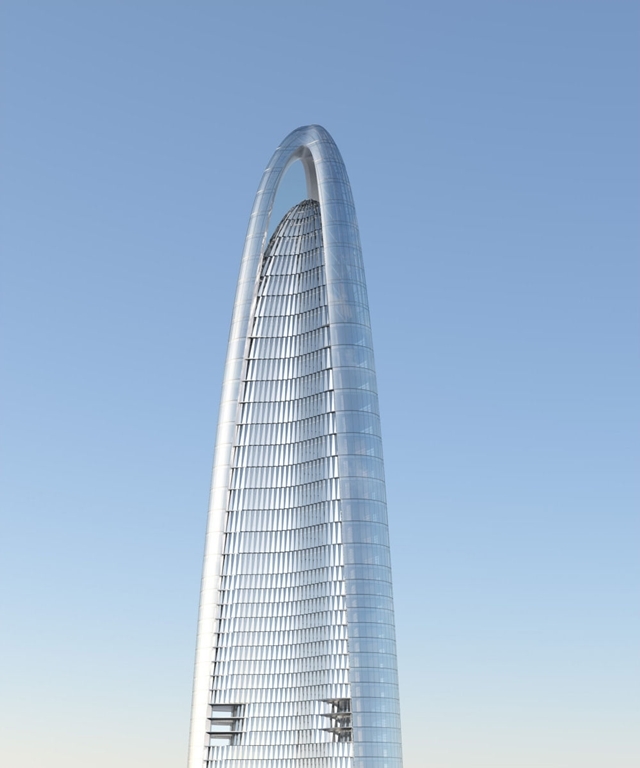 Wuhan Greenland Center features a uniquely streamlined form that combines three key shaping concepts—a tapered body, softly rounded corners and a domed top—to reduce wind resistance and vortex action that builds up around supertall towers. The building’s extremely efficient aerodynamic performance will allow it to minimize the amount of structural material (and the associated embodied carbon) needed for construction. The tower’s three corners rise from its tripod-shaped base and taper upward, culminating in an arched tip above the dome at the top. The corners will be of smooth curved glass, contrasting markedly with the more textured curtain wall cladding the body of the tower. The curtain wall will enclose a composite concrete core with steel framing. 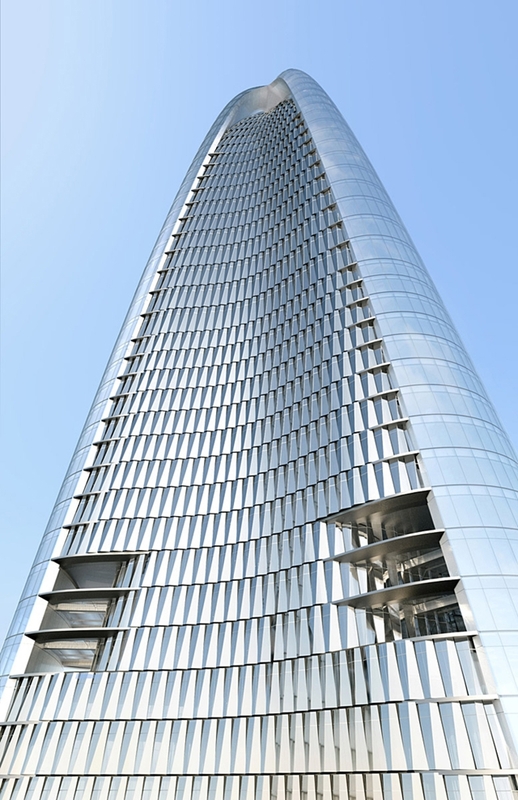 Apertures in the curtain wall at regular intervals will assist in venting wind pressure against the tower; the apertures will also house window-washing systems and air intake and exhaust systems on mechanical floors. - Energy recovery using an enthalpy wheel integrated into the ventilation system; this captures energy from the building’s exhaust systems and uses it to pre-heat or pre-cool air entering the building. - A greywater recovery system, which takes waste water from the hotel laundry, sinks and showers and reuses it in the building’s evaporative cooling system. - A high-efficiency lighting system, which uses low-energy-consuming ballasts and lamps to reduce required power consumption.A daylight-responsive control system, which automatically turns off electric lights when sufficient daylight is available. - Water-conserving low-flow plumbing fixtures, which reduce the total amount of potable water required as well as the associated pumping energy. In addition, the AS+GG Interiors studio is developing the tower’s fluidly sculpted interior public spaces, many of which reflect the tower’s exterior silhouette. The conical silhouette is visibly echoed in the entrances to the primary elevator bank from the main lobby, as well as in the shapes of the elevator cabs and other public spaces. The lobbies and other amenity spaces within the tower also feature sweeping, fluid lines and a neutral blue-gray palette that recalls the reflective glass of the exterior wall. The transparency of the ground-floor lobby wall allows views from inside toward the entry canopy drop-off areas, establishing a seamless relationship between the interior and exterior."